In this sweeping and powerful epic the journey begins in the "terrible beauty" of Northern Ireland during a time when conflict reigns and no one is spared from tragedy and sorrow, the time known as The Troubles. It is the spring of 1968 in Belfast and James Kirkpatrick has just lost his father under suspicious circumstances, Casey Riordan is released from prison after five years and Pamela O'Flaherty has crossed an ocean and a lifetime of memories to find the man she fell in love with as a little girl. All three lives are on a collision course with each other against the backdrop of the burgeoning civil rights movement and a nation on the brink of revolution. They come from disparate backgrounds - Jamie a wealthy aristocrat whose life is like an imperfect but multi-faceted jewel-brilliant, flawed and with a glitter that is designed to distract the observer. Casey, a card-carrying member of the Irish Republican Army, who must face the fact that five years away has left him a stranger, a misfit in his own neighborhood where not everyone is sympathetic to a convicted rebel. Pamela, who has come to Ireland in search of a memory and a man who may not have existed in the first place. Through it all runs the ribbon of a love story: love of country, the beginning love of two people unable to resist the pull of each other regardless of the cost to themselves and those around them, and the selfless love of one man who no longer believes himself capable of such emotion. It is an electrifying tale of a people divided by religion and politics, a tale of love and danger, of triumph and tragedy. Ultimately it is the story of that "terrible beauty" herself - Ireland - and how nation is bound to one's identity, woven into the weft of all we become. This is the first book in Cindy's series and it is wonderful! The writing is brought to life by Gary in such a passionate, intriguing manner that you'll fall in love with the characters and with Ireland. Cindy's words can bring me to tears and make me laugh out loud and Gary's voice leaves an emotional, indelible mark on my heart. 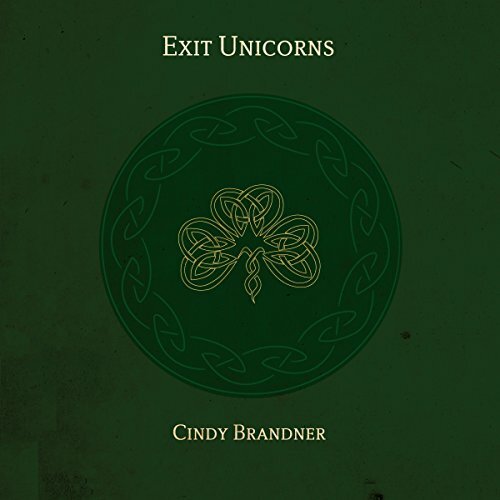 I strongly recommend Cindy's books and the best palce to start is with Exit Unicorns. I love this story, this series, this world tucked away in the fabric of Cindy's mind. I have read the entire series thus far, and long for the next book to come out. It's that good. It took me 3 tries to get past the first part of this book over a number of years, for reasons I am not entirely sure. When book 4 was to come out, I decided to get serious about this series and finally read it. I know the author personally, she is a friend, and the books were always in the back of my mind. It's nice that way so you don't forget about them. I finally plunged right in, and once I got past the first bits, which is a lot of detail and history I couldn't put the book down. I then inhaled the next 2 books, and her collection of short stories about the characters a full year before book 4 was to be released! If only I had done that years ago, but then I would have had to wait longer for the next book in the series to be released. When Cindy announced that the Exit Unicorns was going to be put into audio, I wasn't sure I was going to listen to it. I have only listened to one other audiobook a number of years ago, and I wasn't all that impressed. It is just not a format I thought I would enjoy. If you haven't delved into the world of Exit Unicorns, then you are missing out on an epic work of art!! Cindy writes like no other person I have read. She is a master storyteller, and you are transported into the story through beautifully written prose. I have fallen in love with the characters, and this story so much. I have always had a love for all things Irish, but as The Troubles started before I was born, I was never aware of Ireland's bloody past. This series has taught me history, it has taught me about passion, it has taught me about strength, and most of all it has taught me about true and passionate love for one's country. You will laugh, you will cry, you will feel joy and such sorrow. You will feel love, and passion like no other. If you have a passion for all things Irish, then this is a series you can not afford to miss out on! Read it! You won't be sorry. I can not wait until next summer when book two is set to release on audio, so I may have to just re-read the book now, and listen later. Enjoy!! Love the series and was anxiously awaiting the audible version so that I could have this intriguing and beautifully descriptive novel read to me by someone with a lovely Irish accent! Home run - the narrator is just perfect and I’m thrilled so far. May update after I’ve listened to the entire thing, but I’m sure it will only be to heap further praise upon both the author and her excellent choice of narrator! This is the first book that has had me gripped since reading the Outlander series. What made the experience of listening to Exit Unicorns the most enjoyable? Gary Furlong, as the narrator made the listening experience incredible. I loved his voice and he was absolutely brilliant in his reading of the book. He literally made the characters jump out at you with the voices he put to them. The narrator can either make or ruin the books you listen to. I've had several good story's ruined, just by the narrator that was chosen for that particular book. Not so in this case! I love that this story was based on true historical events in Ireland, in the not so distant past. Though the characters are supposed to be fictional, they could have actually been real. I enjoy the way Cindy Brandner writes her stories, you feel everything from heartache to passion and everything in between. For me, reading / listening to the book, took me directly to Ireland and placed me in the midst of the story. Which character – as performed by Gary Furlong – was your favorite? My favorite character performed by Gary, had to be hands down....Casey! Though I love Jamie, Pamela & Pat, just as equally. The voice he gave Casey, was exactly how I would have expected it to be from when I first read the book several years ago. To pick only one or two moments in the book that moved or captivated me is almost impossible. From start to finish, it gripped my heart strings and never let go. Being a huge Outlander fan, I had a hard time finding books that really touched me deep within after reading the series. I accidentally stumbled across The Exit Unicorn Series, and was hooked from the very first book. Cindy is an exceptional and heartfelt writer, she is in the same league as Diana Gabaldon, as far as I'm concerned. Using Gary Furlong, as the narrator was simply genius! I loved reading the book series, but listening to him read, was such a marvelous experience, it made me love the book that much more. I cannot wait for Mermaid in a Bowl of Tears to come out. I read this book and the ones following a few years ago, and as the author is working on the next installment, I wanted to reacquaint myself with the characters. Listening to the audiobook only enhanced the beauty of the writing. I had forgotten the intricacies of the story and the subtleties that enrich a reading experience. I found myself rationing the chapters so that it wouldn’t end. Exit Unicorns is really setting the stage for an epic saga that will twist and move through time and space like few storylines I have read. The paths of these characters is sometimes brutal, but achingly raw and real at the same time. I read these books before visiting Belfast for the first time, and the descriptions of the city’s entwinement with “The Troubles” were so accurate that I recognized landmarks and knew where key incidents had occurred. Cindy’s writing weaves a spell around her readers that invokes literature and poetry long forgotten from English class, the harshness of an age-old bloody battle for territory, and the perspective of historical reflection - all wrapped up in the complex relationships of a group of people caught in a vicious time in history. Survival in this tale is a personal pursuit, gone about in a multitude of ways in which only the reader ever truly understands. As with life, the characters go through their struggles the best way they know how, sometimes to their own detriment. If given the chance, these books will draw the reader so deep inside another time that the reemergence into the “now” is wistful. The writing is vivid in description without getting lost in the weeds. I can’t recommend this series enough for readers who relish storytelling that connects them with the characters, flawed and as different as any people could be, but real and so personable that the reader is able to see a bit of themselves in each of the main characters. It’s history. It’s poetry. It’s war at its worst. But it’s also about love in every facet imaginable, between lovers, parents and children, brothers, friends, countrymen, and even strangers. Give it a try. You’ll be happy you did! Now I am thrilled to listen to Gary Furlong read them to me. As Entertained and spellbound as I was with the written book. BRAVO BRAVO BRAVO BRAVO !!! Gary Furlong, Cindy Brandner's Exit Unicorns narrator, is THE BEST I have ever listened to. I forgot how much I loved to be read to. It goes without saying that I love the Exit Unicorns series. Wanting something to do while I draw, I have listened to music and watched my iPad. But I have had so many bad audio book experiences, I was very hesitant to try this. Some voices are not meant to be heard for long durations, no matter how much you enjoy the content of the book. I had earned some free credits on my amazon prime audio account, so I thought, well, let's try ONE more time. If you are reading/hearing this book for the first time, or if you are like me, a fan and listening for the first time, you will not be disappointed. Gary doesn't make women sound like cackling hens or project these huge voice variations for different characters. His intonation changes, but at just the right, pleasant level, that it makes the story interesting and easy to follow. The next book, "Mermaid in a Bowl of Tears" (next in the series) just came out for purchase. Can't wait to hear that as well! Lovely Story with a captivating narrator! Hauntingly epic love story that is wrapped around unforgettable characters: James Kirkpatrick, Pamela O'Flaherty, Casey and Patrick Riordan that lavishly evokes the land and history of Ireland during the Northern Ireland Conflict. Absolutely loved the book and was so excited to listen to the Audible version. I tend to read rather quickly and the audio version helped me to really listen to all of the words, which in turn made me realized I had missed some important parts of the book. Gary Furlong has a wonderful Irish lilt to his voice, which draws you in. I thought he captured the essence of each character in a delightful way. I felt like I was sitting in the background of the scenes as a silent witness to a fantastic story. I could listen to Gary’s voice all day long! I can’t wait for Mermaid in a Bowl of Tears to come out on Audible.com. i read this 5 years ago. I just finished listening to it. Amazing either way! Cindy Brandner’s story and series is one of my favorites; so, I looked forward to the audio version. Gary Furlong did not disappoint. Each voice is unique to the character, easily distinguishable. Hearing the story told by the characters was absorbing. I eagerly await Mermaid in a Bowl of Tears. If you like history well-told with well-defined characters, you’ll enjoy this book.